Intelect’s electrical apprentice Alex Mason has been named the North East Electrical Apprentice of the Year by training provider JTL. “My apprenticeship was a great learning opportunity for me, as it not only gave me workplace skills, but also life skills too,” said Alex. “It’s helped me get one step closer to my end career goal of becoming a Chartered Engineer. Alex’s training officer nominated him for the award after being impressed by his progress over the past four years. 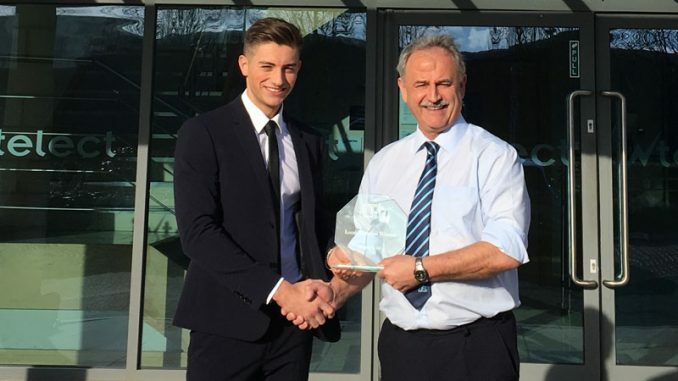 Alex was presented with his award at Intelect’s head office at Riverside Park in Middlesbrough by JTL’s regional manager Brian Mills (pictured above) and will find out in the coming weeks if he has been successful in the next stage. Intelect have been working with JTL for over a decade, working together to train over 50 successful electrical apprentices.